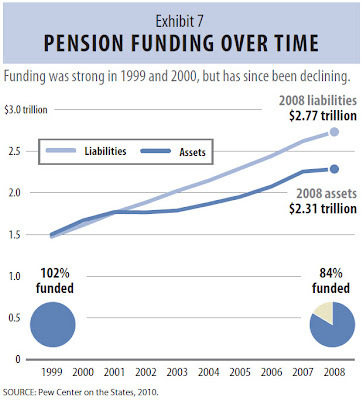 Source: The Trillion Dollar Gap: Underfunded state retirement systems and the roads to reform. From the executive summary: "Of all of the bills coming due to states, perhaps the most daunting is the cost of pensions, health care and other retirement benefits promised to their public sector employees. 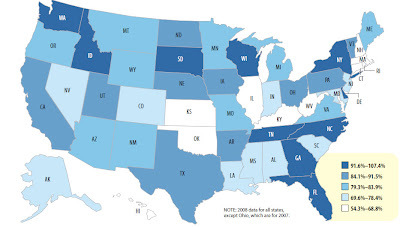 An analysis by the Pew Center on the States found that at the end of fiscal year 2008, there was a $1 trillion gap between the $2.35 trillion states and participating localities had set aside to pay for employees’ retirement benefits and the $3.35 trillion price tag of those promises. 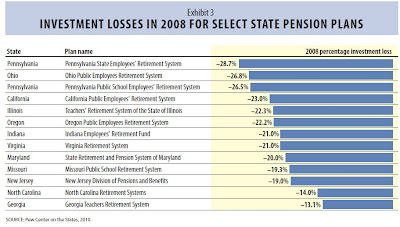 To a significant degree, the $1 trillion gap reflects states’ own policy choices and lack of discipline: failing to make annual payments for pension systems at the levels recommended by their own actuaries; expanding benefits and offering cost-of-living increases without fully considering their long-term price tag or determining how to pay for them; and providing retiree health care without adequately funding it."